After successful login, the Bidder can see his home page which is divided into three blocks namely Left Navigation Block, Middle Body, and Right Navigation Block. In this post, we will discuss the links available in the Right Navigation Block. The Right Navigation Block consists of two sections Notifications and My Profile. The notifications issued by EPS administrator from time to time for Bidders will appear in the Notifications Section. The profile details of the currently logged in user can be accessed through this link. Clicking on this link opens the User Profile page. 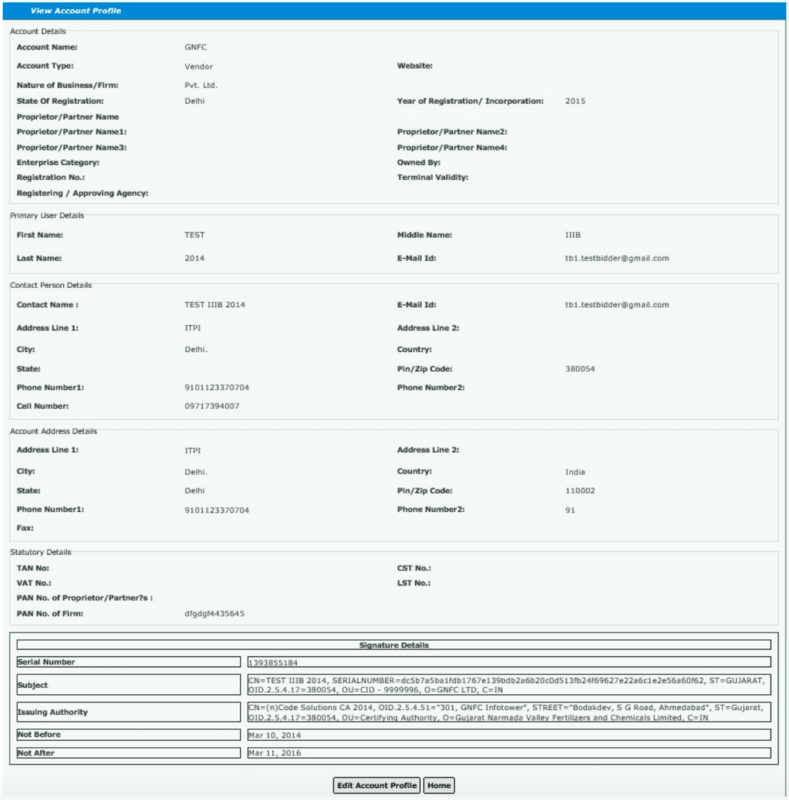 On this page the logged in user can view his profile details like E-Mail ID, Firm’s Name, User Name, User’s Address and Contact details etc. The logged in user is also allowed to update some of these details like Address and Phone numbers by clicking on the Edit button on this page. After making the required changes, the user has to click on Sign & Update button. This will open the web signer window. After the user signs the modified data using his DSC, the user profile is updated. The profile details of the user’s account (i.e. Firm) can be accessed through this link Clicking on this link opens the View Account Profile page which shows the details of the Account like Firm’s name, address and contact details etc. The users in a bidder account are categorized as Primary users and Secondary users. 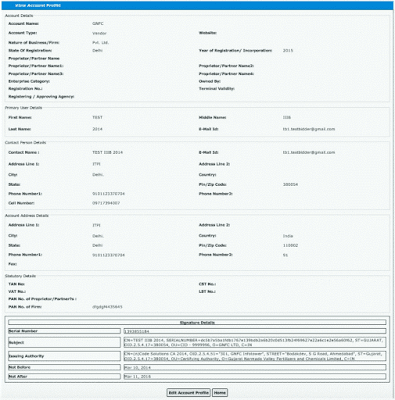 The details of the Primary and other users (Authorized signatories) can also be seen from this page. There can be only one primary user in an account, who is allowed to update some of the Account details such as Address, and Phone Numbers etc. by clicking on the Edit Account Profile button, which opens the Edit Account Interface as shown below. If there are multiple users in the account, the primary user can replace himself and make some other user as the primary user. The user can change his login password by clicking on the Change Password link. Clicking on this link opens the Change Login Password page as shown above. The user is required to enter his old/existing password, and the new password in the relevant fields on this page to change his password. Bank Details associated with the Account can be viewed and edited by clicking on this link. Users are advised to keep this information updated as the tendering department may use this information for making payments to the bills, and for other statutory purposes. 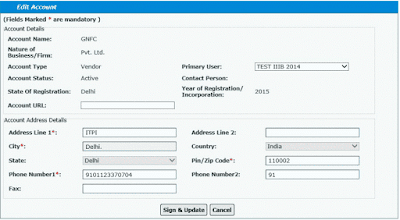 The user has to sign the modified details with his DSC for saving the changes. The details of an existing user listed on the page can be modified by clicking on the Edit action icon. A member can be deleted by clicking on the delete action icon. The logged in user cannot remove himself from the list. 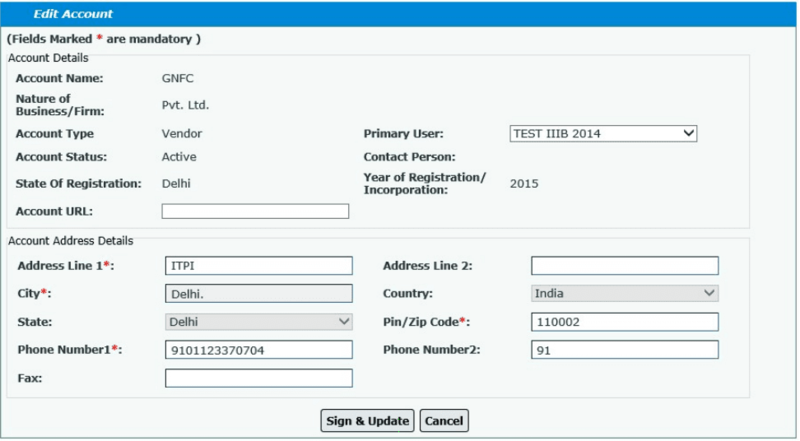 Please fill in all the required details (fields marked * are mandatory) and click on Sign & Submit button. You will be asked to select the public key of the Digital Signing Certificate of the new user being added (please see image below). Please refer to the document Procedure for Public Key Export from E-Token for further details. This document is available in the Learning center, which can be accessed through the Learning Center link available on IREPS home page. Please click on the Browse button to locate the public key to be added to the new user profile, and click on Submit button. This will add a new signatory and a message to this effect will be displayed on the screen. Please note that the signatories so added can submit bids on behalf of the Firm. The Firm/Company/Individual Owner/Proprietor etc. will be legally liable and accountable for all activities performed by the authorized signatories through the IREPS website. Please keep the list and details of the authorized signatories updated at all times. 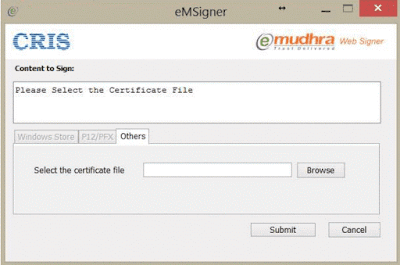 Please remove the name of the authorized signatory immediately if he/she leaves the company. In the case of failure to do so, the Firm/Company/Individual Owner/ Proprietor will be held liable for actions of such signatory.